By design, Commands & Colors Tricorne - The American Revolution is not overly complex. 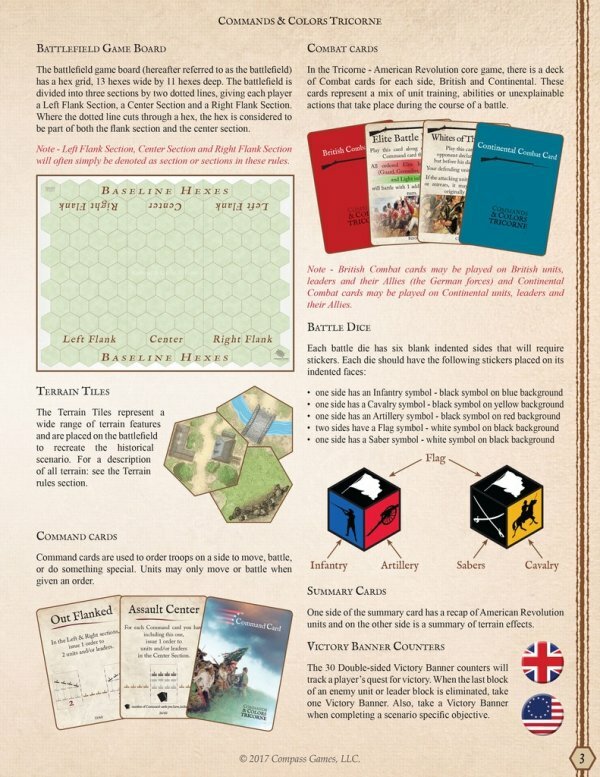 The game is based on the highly successful Commands & Colors game system, where the Command cards drive movement while creating a “fog of war” and the battle dice resolve combat quickly and efficiently. 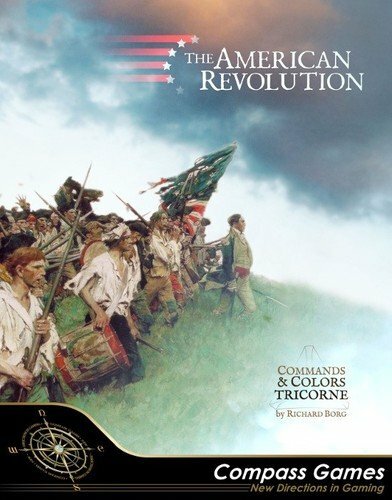 Commands & Colors Tricorne - The American Revolution, however, introduces many new game concepts, which will add historical depth and provide even the most veteran Commands & Colors player many new play experiences and challenges. The scale of the game fluctuates, which allows players to effectively portray some of the larger American Revolution battles, as well as smaller size skirmish actions. In some scenarios, an infantry unit may represent an entire brigade, while in others a unit may only represent a few companies of soldiers. Still the linear tactics of the period, that you will need to execute to gain victory, conform remarkably well to the advantages and limitations inherent to the various American Revolution Armies of the day, and the battlefield terrain features on which they fought. To further emphasize the differences in battlefield doctrine between the British and Continental forces, each army has its own unique deck of Combat cards. 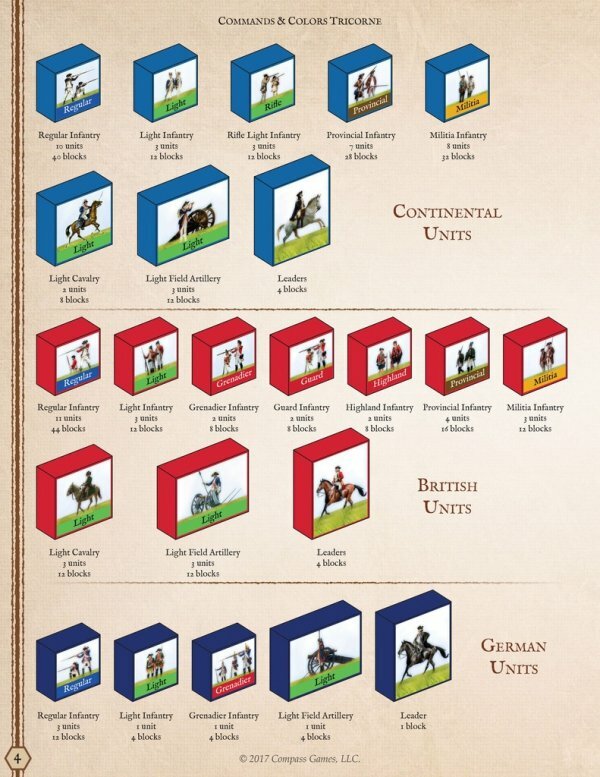 Players, that are familiar with other Commands & Colors games, will soon note that unit combat losses in a Tricorne game are typically not as great as other games covered in the Commands & Colors series. This is a direct result of the linear tactic fighting style of the armies that fought during the American Revolution. Unit morale is the main thematic focus in a Tricorne battle as it was historically. Knowing that an entire unit, that has only taken minimal losses when forced to retreat, may actually break and rout from the battlefield, will definitely keep players on the edge of their command chairs during an entire battle.